You've just had your food- You will always show an increase inweight after you have had your food. No, you don't actually gain weight. The increased weight is due to your increased blood volume and has more to do with the food that is sitting in your stomach and digestive system. You had a lot of salty food- High sodium foods make you retain fluids and show an increase on the scale. This gain is temporary and subsides in a day or two. 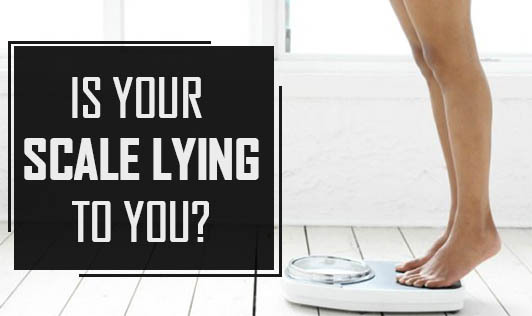 When you weigh yourself- You will always get the most accurate and consistent readings when you weigh yourself early in the morning before eating or drinking anything. Weighing later during the day will show a 2-4 pounds increase in your weight. Hydration- Water helps to maintain body fluids levels. When you don't drink enough water, your body is forced to retain fluids to maintain the fluid balance in the body and in turn shows an increase in weight! You weighed yourself a day after an intense workout- Muscles tend to pull in water to recover from an intense exercise session. This spills on to the next day or two. You will most probably show an increase a day after you have completedan intense cardio workout, vigorous walk, or bike ride. Excessive exercise- If you are pushing yourself extremely hard on diet and exercise, you will probably not lose weight. When you push yourself to extremes, your body tries to protect itself by reserving fat stores. Decrease your exercise intensity for a week or two to get your scale moving. High stress- High stress levels can cause hormonal changes and increase fluid retention,thereby causing an increase in weight. You have been traveling a lot recently- Many people tend to gain a few pounds after any type of travel. Most people tend to retain fluids due to changes in atmosphere, extended sitting or even local weather changes. You have got your menses- Women can show an increase in weight throughout their menstrual cycle. Women undergo hormonal fluctuations that can cause fluid retention that lasts up to 7-10 days and show artificially high weight. You have gained muscles- Strength training for a very long time can affect your body weight. Muscles pull extra water into the cells and show changes in the weight. This weight is not at all related to your fat stores. Hot humid weather- Your body tends to hold extra fluids to combat the hot humid weather and in turn show an increase in weight.